A missile used high power microwaves to knock out computers and electronics without damaging buildings during a U.S. test on Oct. 16. "In the near future, this technology may be used to render an enemy's electronic and data systems useless even before the first troops or aircraft arrive," said Keith Coleman, CHAMP program manager for Boeing Phantom Works. That spawned the military dream of a nonlethal takedown weapon that could disable an enemy's radar, communications and targeting computers — effectively leaving them blind and unable to respond effectively to follow-up attacks by regular military forces. Such weapons could prove especially useful when assaulting enemies hidden in heavily populated cities or towns without causing civilian casualties. Such critics were apparently wrong. The CHAMP missile's microwaves proved so effective during the recent test that they knocked out some of the cameras used to record video footage of rows of computers blinking off. CHAMP went on to hit seven targets during the one-hour test. CHAMP's three-year, $38 million program could eventually deploy up to five prototype missiles. 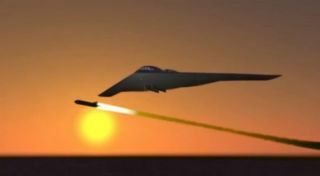 The latest testing seems to suggest that Boeing and the Air Force have succeeded in creating a functional missile capable of taking out many targets with multiple shots. Follow TechNewsDaily on Twitter @TechNewsDaily, or on Facebook.